The Mercedes-Benz W126 class was the S-Class sized battleship from Stuttgart and lasted for a remarkable 12 year production run (1979-1991), a record since Mercedes started building their flagship mega-sedans in the early 1960s. The W126 was designed by Bruno Sacco who also penned the W126/W140/W220 S-Classes...as well as the R129 SL convertible, W202/W203 C-Class, W124/W210 E-Class, CLK & SLK sports cars, M-Class SUV, and was a part of the design of the W123. His reign as Mercedes-Benz design director lasted from 1975 to 1999, and his absence is clearly seen in the aimless design years of the 2000s. It didn't help that the W211 looked like a Camry, but had the reliability of a Yugo. Its okay, you don't need to buy a wreck from the Daimler-Chrysler era , stick to the W126 and you'll be fine. 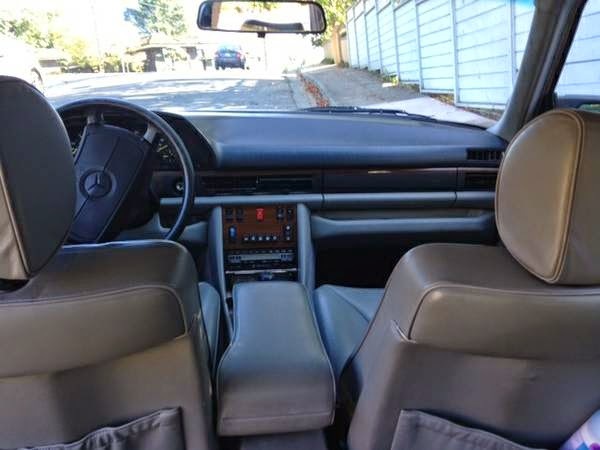 Find this 1990 Mercedes-Benz 420 SEL offered for $3,500 in Oakland, CA via craigslist. Tip from Kaibeezy. 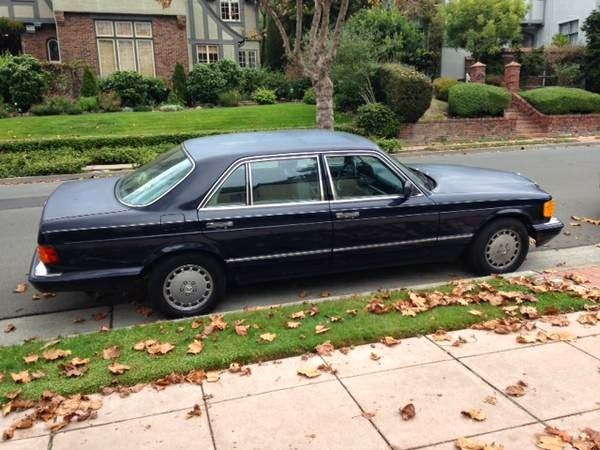 If you are going to buy a W126, you may as well get the flagship long wheel base huge-engine variant. This is also a later model in the production life, so teething problems will have been addressed and it should be better equipped. The top of the paint looks iffy in the photo, but it could be morning dew or a strange reflection, because the seller only mentions the scratch on the rear 1/4 panel and a missing drivers side window -- but otherwise calls it a gem of a car. 72k miles on the odometer lends credence to this opinion. This 420 SEL is powered the M116 4.2 liter V8 putting out 221 horsepower and 240 ft-lbs of torque, all mated to a 4 speed automatic transmission. The big Benz doesn't drive like a Miata - but it's not slow like a Panzer tank...think more like an M2 Bradley or HMMWV. It has got enough torque to get to 60 mph in 8 seconds; not fast by modern standards, but it'll let you merge safely on the freeway if you can afford the 1/2 gallon of gas, and these things are thirsty for dino juice. The seller didn't include many exterior shots, so I grabbed this screen from Lethal Weapon 4 -- that is Mel Gibson's stunt double on an upside down table being dragged behind a pre-fab home...you'll need to see the movie to understand, but one look at that W126 and you know you want it. The "huge engine" flagship variant would be the 560SEL, though I concur with the recommendation to stick to the 420SEL. Super smooth engine, not much performance tradeoff from its bigger brother, slightly better economy. If you're looking for a distraction, search the you tubes for videos of these things (W126 420/560) uncorked. They sound ridiculously mean. It also makes you kind of appreciate the amount of engineering it took to muffle these things down to a transparent, almost appliance-like whisper that they make stock. Though naturally, if I had the money/time, I would buy one strictly to straight-pipe it post x pipe and cat just to see the looks on people's faces. RyanM -- you are correct. This one is the large but not huge engine version. The 560 adds an additional layer of complexity and pucker factor while marginally improving performance.